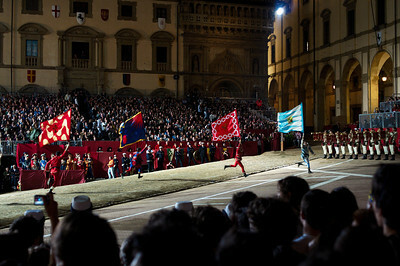 We timed our visit to Arezzo to catch the totally wacky local event: The Saracen Joust (Giostra del Saracino). Qualifying it as wacky may be a little unfair, the event is deeply rooted in the city's history and once served the important task of training Arezzo's young men for battle (Saracino = Muslim). Although not quite as serious as it may have been centuries ago, the whole city seems to take part in the festival's activities with a certain air of competitiveness. We had a vague idea of the day's events but we arrived early in the morning to make sure not to miss anything. While we did arrive three hours early to a pretty empty city, we guaranteed ourselves a prime spot for watching the "battle proclamation", the day's first event. 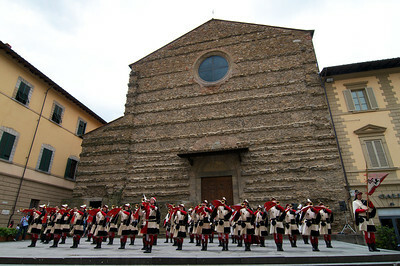 The proclamation is read from the steps of the 800 year-old Basilica San Francesco and followed by a procession of various medieval-costumed men, each representing one of the four Arezzo city quarters (named after the four city gates: Porta del Foro, Porta San Andrea, Porta Santo Spirito and Porta Cruciferaa). Acne-faced teenagers marched through the streets in colourful leggings and chain mail - we wondered if they had volunteered enthusiastically (and marvelled at the thought that they very well may have). City residents sporting their quarters' colours and coat of arms cheered as their team paraded by. Vendors lined the streets hawking a selection of toys and clothing showing off team colours. 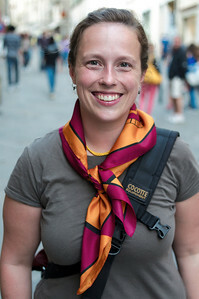 To fit in, I bought a Porta del Foro bandana which I wore all day around my neck (I liked the lion on the coat of arms). Yann found me somewhat embarrassing and balked at the cost of my newly purchased item but I strode around with confidence. Yann's parents joined us in the late afternoon, in time to catch another, more elaborate procession. This time the actual jousters were on hand to be blessed on the footsteps of the cathedral by the local bishop (seriously). 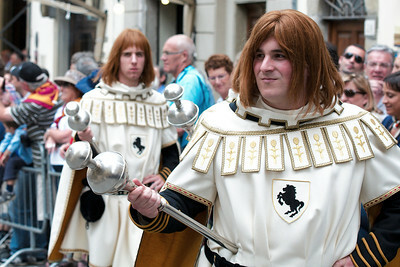 Yann and I already knew the jousters from their full page feature in the local paper. We struggled for a view of the blessing amidst crowds of people, some tourists, but mostly locals. 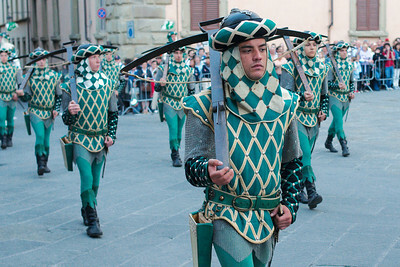 We were able to follow the jousters through the streets of Arezzo on their way to the city square turned jousting arena, the central Piazza Grande. A dirt mound runs transversely across the square, surrounded on two sides by stands and the other two sides by standing room cheering sections. 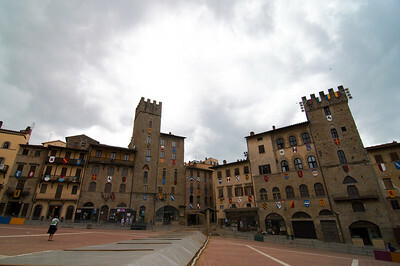 Beautiful old homes surround the square and residents crowd the windows that look out onto the jousting pit. We rushed ahead towards the arena hoping to get good "standing spots". Fans are divided into the two viewing areas by team colours (two quarters in each area). 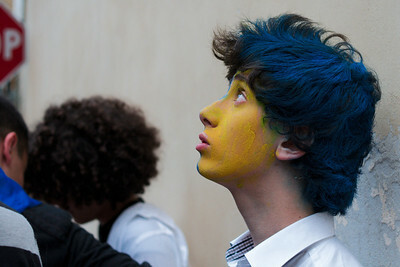 Despite sporting my Porta del Foro lion bandana we ended up in the wrong viewing area, surrounded by blue and yellow. It didn't really matter because the four of us looked so out of place as it was (for one, because we were the oldest people there - anyone over the age of 18 was sitting in the stands). Our standing area got more and more crowded as the evening went on and we did our best to watch the acrobatics show preceding the joust as blue and yellow smoke bombs exploded around us. We seemed to be the only people in our area who cared about watching the warm-up act. When the jousting actually began the crowd quieted down a little bit, but mainly when waiting for the judges' scores to be announced. Residents watching from their balconies would announced the scores in advance to the crowds below (from watching simultaneous broadcast on their televisions). The maximum score a jouster can get in one round is 5 points; by hitting the rotating dummy (Saracino) without being hit by its spinning arms. Depending on the positioning of the hit, the jouster receives anywhere from 1 to 5 points, if the jouster gets whacked by the spinning Saracino he loses points. Each quarter is represented by two jousters and at the end of the night the team with the highest combined score receives a golden lance (and probably some cash too). Early in the competition one of the riders was given a score of 3 after what appeared to be a fairly decent slamming of Saracino. His teammates, feeling that he deserved a higher score, rushed the judges' table and began throwing punches, prompting a hilarious brawl of leggings-clad fighters. We couldn't figure out if this type of antic was staged for the audience, by the weirdness of the event we wouldn't have been surprised either way. Nobody seemed overly concerned with the fighting and the competition continued without much of a delay. We watched a few more jousts from our crammed standing area, without really having an actual view of what was going on. We decided to head home before the end of the joust, after a great, but long day of bizarre entertainment. 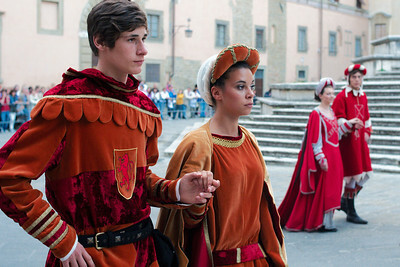 We left the competition to the people who seemed to really care about the results: the teenagers of Arezzo.